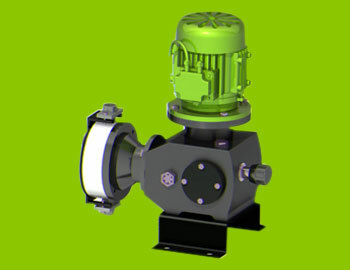 Mechanical actuated diaphragm pump is generally used for water and waste water treatment chemicals. It has a capacity ranging from 0 to 720 LPH and pressure up to 5 Kg/Cm2. This mechanical actuated diaphragm pump is designed excellently to be used for low capacity and low pressure. This mechanical actuated diaphragm pump has PTFE coated diaphragm which is motor driven. It is ideal for continuous duty applications and extensively used for handling corrosive fluids. The PP, PVC, PTFE, SS materials are available as a wetted parts of Pump.